Marrakesh is a city that sums up all of Morocco's exotic North African charm. The city's name provided the root for the name of the country itself, spelling out this town's importance through the ages. Within the hustle of the medina, you'll find the city's main points of interest in a dizzying meld of ancient and new. Just soaking up the atmosphere here tops the things to do list, with snake charmers and smooth shop touts both competing for your attention amid a noisy, colorful bustle that encapsulates Morocco's vibrant soul. For shoppers, this city is famous as a frenzied hub for bargain hunting. For history loving tourists, the many museums and monuments are some of the country's sightseeing must-dos. And for those who just want to dive into local culture, the medina offers Moroccan life in all its hectic glory. Marrakesh is also the gateway to Morocco's High Atlas region, where you can relish the scenic mountain beauty after your Marrakesh metropolis adventures. For many visitors, Marrakesh's labyrinthine medina (old city) district is the town's star attraction. The narrow alleyways are a kaleidoscope of colors, scents, and sounds, and bound to be the sightseeing highlight of your trip. As well as simply wandering (and getting lost) amid the bustling maze, there are myriad shopping opportunities, where you can put your haggling hat on and barter to your heart's content. Shoppers shouldn't miss the Babouche (shoe) Souk, Chouari (carpenter's) Souk, El-Attarine (perfume and spice) Souk, and the Cherratine (leather) Souk. Just west of the main souk area, at the end of Rue Bab Debbagh, you'll find Marrakesh's tanneries, where animal skins are still dyed the old-fashioned way. This large square at the entry to the medina is the center of Marrakesh life. The Djemaa El Fna (assembly place of the nobodies) is a vibrant hub of bric-a-brac stalls, musicians, storytellers, fortune-tellers, and snake charmers that never seems to rest. Here, the entire spectrum of Moroccan life enfolds before you. If being down among the thrum becomes too much, it's also easy to escape to one of the many surrounding rooftop cafés and restaurants where you can survey the crazy scene from above. The Koutoubia Mosque is Marrakesh's most famous landmark with its striking, 70-meter-tall minaret visible for miles in every direction. Local Marrakesh legend tells that when first built, the muezzin (man who calls the faithful to pray) for this mosque had to be blind as the minaret was so tall that it overlooked the ruler's harem. The mosque was built in 1162 and is one of the great achievements of Almohad architecture. Non-Muslims are not allowed into the mosque itself. Built in 1565 by the Saadians, the Medersa (madrassa - Islamic school of learning) of Ben Youssef is the largest theological college in Morocco. The warrens of rooms (with student cells that once were home to 900 pupils) are clustered around small internal courtyards in typical Islamic architecture style, but the main internal courtyard is the real highlight here. The fine zellige tiling, stalactite ceilings, cedar-wood detailing, and Kufic inscriptions used as decoration across the courtyard's interior make this medersa one of Morocco's most beautiful buildings and a star medina attraction. This 16th-century burial ground is home to 66 members of the Saadian dynasty, which ruled over Marrakesh between 1524 and 1668. The tombs here include that of the ruler Al-Mansour, his successors, and their closest family members. It's a rambling, atmospheric place, with the mausoleums set amid a rather overgrown garden. In particular, the main mausoleum (where Moulay Yazid is buried) has a fine surviving mihrab (prayer niche). The Saadian Tombs were walled up by their Alawite successors and were only rediscovered in the early 20th century. This magnificent peacock of a palace was built in the late 19th century as the residence of the Grand Vizier Bou Ahmed, who served Sultan Moulay al-Hassan I. The interior decoration is a dazzling display of zellige tiles, painted ceilings, and ornate wrought-iron features showcasing the opulent lives of those high up in the sultan's favor at that time. The massive marble grand courtyard and opulent salons of the haram area are the two main attractions, while the lush internal courtyard of the grand riad, with its banana-leaf plants and citrus trees, is a tranquil respite from the city. This lovely old palace built by Vizier Si Said is home to a wonderful collection of Berber jewelry in finely worked silver, oil lamps from Taroudant, pottery artifacts, embroidered leather, and marble. There is also a display of Moroccan carpets and an amazing collection of traditional Moroccan door and window frames, which highlight this country's local architecture styles. For anyone interested in the evolution of North African art and crafts, it's a lovely place to potter about for a couple of hours. Near the Dar Si Said, the Maison Tiskiwin has a rather wonderful collection of costumes, jewelry, arms, musical instruments, textiles, and furniture (focused on Saharan culture) put together by Dutch art historian Bert Flint. Another branch of the museum is in Agadir. The Marrakesh Museum has an eclectic collection ranging from contemporary art to Qur'anic inscriptions, with local ceramic work, textiles, and coins thrown in for good measure. For most visitors, the real highlight of a visit here is the building in which the museum is housed. The Dar Me'nebhi was built in the early 20th century and was once home to a minister in Morocco's government. The architecture is a harmonious blend of local North African form with Portuguese elements, and features an extremely impressive central courtyard area complete with lavish chandelier. Also known as the Koubba Ba'adiyn, the Almoravid Koubba is Marrakesh's oldest monument - built in the 12th century during Ali Ben Youssuf's reign. Although its original use is unknown, some experts have suggested that it may have been the ablution house of a mosque that once sat next door. Its simple exterior design (a squat, square building topped with a dome) belies an interesting interior, with a dome ceiling covered in Almoravid motifs. The koubba was one of the few buildings to survive the damage inflicted by the Almohad conquerors, who destroyed much of the earlier Almoravid architectural legacy. These lush tropical gardens full of cacti, palms, and ferns, are the work of painter Jacques Majorelle. Originally from the town of Nancy in France, Majorelle came to Marrakesh for health reasons and became well known for his paintings of local Moroccan life. His most famous work, though, was this garden and the vibrant blue (the color now known as Majorelle blue) painter's studio he lived in on the grounds. After Majorelle's death in 1962, French fashion designer Yves Saint Laurent bought the property and upon his death in 2008, his ashes were scattered in the gardens. Majorelle's old painting studio is now home to a fabulous museum dedicated to Berber artistry. A museum dedicated to YSL's life and famed fashion legacy is currently being built on the grounds as well. The ruins of Al-Mansour's once grand palace are one of the kasbah area's most atmospheric sights. The Saadian ruler built the opulent palace, with pavilions set amid a mammoth garden of reflective pools, during his triumphant reign, but it was plundered and destroyed soon after. Now the sparse remnants of mosaic-tiled floors, ruined pavilions, and the high enclosing walls are all that remain. There are excellent views across the medina from the top of the walls, where storks have also built their nests. After viewing the palace, head to the Mellah - the old Jewish quarter of Marrakesh. It was established in the 16th century and is now populated mainly by Muslims. The small synagogue here has been nicely restored and can be visited, as can the vast Jewish cemetery. This huge garden, once a royal retreat, is a bubble of serenity hidden right in the heart of Marrakesh. It's a favorite spot for locals, who want to escape the hustle and enjoy some peace and quiet. The majority of the area is taken up with olive groves, but for visitors, the main attraction and reason to come here is the large reflective pool with its fine pavilion. Built in the late 19th century, the pool and pavilion are a favored spot for many local Marrakesh families, who come here to picnic and stroll. There are excellent photo opportunities here of the pool with the Atlas Mountain Range reflected in its water, on a clear day. Even in a country chock full of sublime road-trip scenery, the Tizi-n'Test Pass stands out. This winding mountain road heads south out of Marrakesh down to Taroudant in a dizzying array of switchbacks that may give the wobbles to those who don't like heights. The mountain scenery along the way is simply sumptuous and allows a taste of Morocco's vast and beautifully raw countryside. A road branching off the pass, just past Taliouine, is the start of the high pass into the Draa Valley. The charming mountain village of Imlil is the starting point for excursions into Toubkal National Park. It's a chilled-out kind of place that provides respite if you've been amid the Marrakesh hustle for a while and are seeking some peace and quiet. The village is also home to a rather impressively restored kasbah (fortress), which is a great place to come for a coffee or tea and take in the rural mountain scenery. The structure is now one of the town's best hotels and played a starring role in the Martin Scorsese film Kundun. This national park is the country's most popular, mostly due to being home to Morocco's (and North Africa's) highest mountain, Djebel Toubkal, as well as a number of fantastic walking opportunities that range from multi-day trekking adventures to afternoon hikes. If you don't fancy bagging Toubkal's 4,167-meter peak then you can opt for the lovely, scenic village-to-village Aremd circuit, which has all the sumptuous views without the sweaty effort required for mountain climbing. The time to come is summer, when all the trails are open; even during spring, snow can mean walking activities are curtailed. Luxury Hotels: Oranges and rose blossoms perfume the air at La Villa des Orangers, steps away from all the medina attractions and the Koutoubia Mosque. This is a Relais & Châteaux property, with three patios, a rooftop pool, and a spa with a hammam. In the medina, near the entrance to the old souk, Riad Dar Anika is a more affordable luxury option, with a lovely courtyard pool and warm Moroccan hospitality. If you prefer to stay away from the hubbub of the medina, the Four Seasons Resort Marrakech is a taxi ride away. Facilities include palm-lined pools, a spa, fitness center, and kids' club. Mid-Range Hotels: In the heart of the medina, the evocatively-named Riad Romance resides in a restored 17th-century building, with a lovely courtyard pool, cozy rooms, and a rooftop garden. Also in the medina, Dar Charkia, with a heated swimming pool, is in the Dar el Bacha antique dealers district. All the rooms are air-conditioned, and many come with a fireplace. Orange trees adorn the courtyard at the hospitable Riad Aguerzame, on a quiet side street in the medina, a short stroll from Djemaa El Fna. Budget Hotels: Down a maze of alleys, a ten-minute walk from Djemaa El Fna, Riad Dar Thalge is great-value, with simple but clean rooms, a large patio, and plunge pool. Also in the medina and with a pool, Riad Sadaka has comfortable and cozy rooms and serves up tasty Moroccan cuisine, while Riad L'Orchidee has air-conditioned rooms, a plunge pool, and plenty of inviting nooks for relaxing and dining. See the Sights: On the Marrakech Discovery Tour, you can relax and enjoy the sights while a local guide takes you on a tour through the city's labyrinthine backstreets and bustling souks, as well as historical highlights such as Bahia Palace and the Koutoubia Mosque. This full-day tour includes lunch at a Medina restaurant, entrance fees, and pickup and drop-off from select hotels. Take a Day Trip: The perfect complement to a hectic city stay is the Three Valleys Day Trip from Marrakech with Optional Visit to Takerkoust Lake and Kik Plateau. This full-day tour gives you a great overview of the Atlas mountains, with a visit to three lush valleys, traditional Berber villages, Ourika Valley waterfalls, an optional lunch in a Berber home, and an optional upgrade to include the Takerkoust Lake and Kik Plateau. 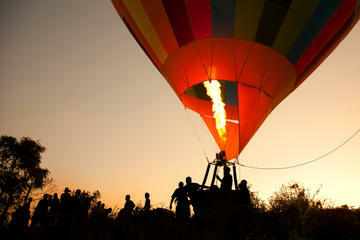 This is a small-group tour with more personalized service and a maximum of seven people. For a different perspective of Morocco's dramatic landscapes, consider the Atlas Mountains Hot Air Balloon Ride from Marrakech with Berber Breakfast and Desert Camel Experience. On this full-day adventure, you travel into the desert by 4x4 and board a hot air balloon for a bird's-eye view of the sun rising over the rippling desert and the Atlas Mountains below. Afterwards, descend to ground level for a delicious Berber breakfast and a camel ride through the desert dunes. Also included is a flight certificate as well as pickup and drop-off from select hotels. The Almoravides made Marrakesh the capital of an empire that covered most of the Maghreb (Northwest Africa) and extended well into Europe. With the Almoravide conquest of southern Spain, Marrakesh was invested with the cosmopolitan culture of Andalucia and became a bastion of Islamic civilization and an intellectual center where the most famous scholars and philosophers of the age converged. Lavish buildings were constructed and splendid gardens designed. The ancient ramparts and gates of the city are monuments to its medieval preeminence. Almohade armies stormed the gates of Marrakesh on March 23, 1147, conquering the Almoravide capital. The Almohades under Abdal Mou'min continued their conquest of North Africa, extending their empire through Algeria and Tunisia and moving across the Mediterranean to capture Seville, Cordoba, and Granada. Under Abdal Mou'min, Marrakesh became an even greater Islamic capital. 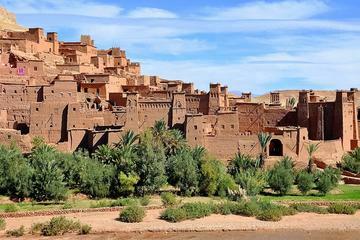 Marrakesh went into a period of decline under the Merenids, who captured the city in 1269. The Merenid capital was already centered in Fes, and Marrakesh fell into neglect for two and a half centuries. The fortunes of Marrakesh revived under the Saadian dynasty. The Saadians were tribesmen from the Souss region, who conquered the whole of southern Morocco in a war against the Portuguese colonialist in Agadir. When the Saadians gained control of the whole of Morocco, their leader, Mohammed Al Mahdi, made Marrakesh his capital in 1551 and began to restore the city. Although the new city district of Marrakesh was constructed in 1913 during the French occupation and reflects this European influence, the majority of the city (like Fes) is a genuinely Islamic city in both its genesis and traditions.